Some of Welbeck's team-mates were also visibly affected by the incident. "They saw it was a big injury," added Emery. "When you are playing football, when you are playing in competitive matches, it can happen. You don't want it to happen, but this is our profession." Welbeck has scored five goals this season, played for England against Spain in September and had been named in Gareth Southgate's latest squad for the friendly with the United States and the Nations League match against Croatia. 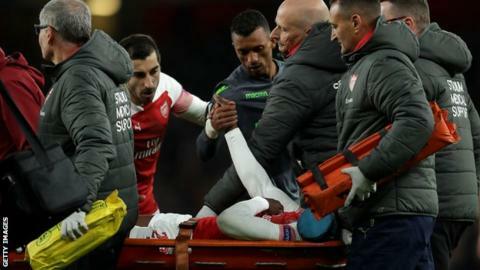 Former Arsenal defender Martin Keown, working as a pundit for BT Sport, said: "Danny has had two major injuries to his knee and he tried to plant his foot and got it stuck behind him. "He is a great player and good for that group as he is 27, one of the older players. He will be a big loss for them. It looks like he will be out for a while." Sporting ended the game with 10 men when ex-Barcelona defender Jeremy Mathieu was shown a straight red card after fouling Pierre-Emerick Aubameyang when he was clean through on goal - although the hosts could not find a winner. The result, along with a 1-0 win for Azerbaijani side Qarabag over Vorskla Poltava of Ukraine in the other Group E match, was enough to take the Gunners through to the knockout phase. They join Chelsea in the last 32, who had secured their place in the next stage with a 1-0 away win at BATE Borisov. Arsenal are fifth in the Premier League, unbeaten in 15 games and have 10 points from their opening four Europa League games. Emery's side are three points clear of Sporting Lisbon in second and will win the group with victory at Vorskla Poltava on Thursday, 29 November. After winning their opening three Europa League games, Emery was able to make nine changes from the side that drew 1-1 with Liverpool on Saturday. Only Rob Holding and Henrikh Mkhitaryan kept their places, with Mesut Ozil, Alexandre Lacazette, Granit Xhaka and Hector Bellerin left out completely. Top scorer Aubameyang started on the bench but came on as a first-half substitute for Welbeck. Aubameyang hit the bar early in the second half and later saw his goal-bound shot blocked by former Liverpool defender Sebastian Coates. Mathieu was dismissed in the 87th minute for fouling the Gabon striker, who fired the resulting free-kick over the bar. There was another injury problem for the Gunners in the second half as right-back Stephan Lichtsteiner pulled up with what appeared to be a hamstring problem on a mixed day for the club. Arsenal failed to score for just the second time under Emery - they also drew a blank against Manchester City in the Spaniard's first game in charge (0-2). Sporting failed to have a shot on target in both matches against the Gunners this season. Sporting kept their first away clean sheet in the Europa League since September 2011 (2-0 vs FC Zurich), ending a run of 18 games in which they had conceded. Aubameyang had twice as many shots as any other Arsenal player (four), but none were on target. Arsenal boss Emery said: "Every match we want the best performance from every player. Some players need to take responsibility and confidence, and there were a lot of positives tonight. "The point isn't enough for us, but at the moment we are on target to be first in the group. "Sporting are a very big, competitive team and organised. We needed to be calm. "It was difficult to create big chances but it wasn't enough to win." Arsenal return to Premier League action on Sunday when they entertain Wolves (16:30 GMT kick-off). The Gunners are next in Europa League action on 29 November, away at Vorskla Poltava (17:55), with Sporting travelling to play Qarabag at the same time. Match ends, Arsenal 0, Sporting CP 0. Second Half ends, Arsenal 0, Sporting CP 0. Corner, Arsenal. Conceded by Sebastián Coates. Offside, Sporting CP. Sebastián Coates tries a through ball, but Bas Dost is caught offside. Jovane Cabral (Sporting CP) wins a free kick in the attacking half. Attempt missed. Pierre-Emerick Aubameyang (Arsenal) right footed shot from outside the box is too high from a direct free kick. Jeremy Mathieu (Sporting CP) is shown the red card. Substitution, Sporting CP. Radosav Petrovic replaces Miguel Luís. Substitution, Sporting CP. Jovane Cabral replaces Abdoulaye Diaby. Attempt blocked. Pierre-Emerick Aubameyang (Arsenal) right footed shot from the centre of the box is blocked. Assisted by Sead Kolasinac. Attempt saved. Henrikh Mkhitaryan (Arsenal) right footed shot from the centre of the box is saved in the bottom right corner. Assisted by Alex Iwobi. Offside, Sporting CP. Bruno Gaspar tries a through ball, but Abdoulaye Diaby is caught offside. Corner, Sporting CP. Conceded by Henrikh Mkhitaryan. Attempt blocked. Abdoulaye Diaby (Sporting CP) left footed shot from outside the box is blocked. Assisted by Bruno Fernandes. Substitution, Arsenal. Ainsley Maitland-Niles replaces Stephan Lichtsteiner because of an injury. Miguel Luís (Sporting CP) is shown the yellow card for a bad foul. Foul by Miguel Luís (Sporting CP). Nani (Sporting CP) wins a free kick in the defensive half. Emile Smith-Rowe (Arsenal) wins a free kick in the defensive half. Substitution, Sporting CP. Bas Dost replaces Fredy Montero. Attempt missed. Alex Iwobi (Arsenal) right footed shot from outside the box is too high. Assisted by Sead Kolasinac following a corner. Corner, Arsenal. Conceded by Marcos Acuña. Attempt blocked. Matteo Guendouzi (Arsenal) right footed shot from outside the box is blocked. Delay in match Fredy Montero (Sporting CP) because of an injury.